My husband is good at a lot of things, but it’s safe to say that packing isn’t one of them. Like most men, he puts zero thought into what he’s taking on holiday until the night before, by which time it’s too late to get anything that isn’t on the shelves of Duty Free. So it falls on me to get the essentials for him before we head away to the sunshine. Where as I’m happy to decant my favourite skincare products into travel-sized bottles and pots, my husband just couldn’t be bothered with the fuss – and in his haste, he’d probably apply shower gel in place of eye cream and vice versa. So a no-nonsense, good quality skincare set is worth its weight in gold. You can’t go wrong with Clarins Men Grooming Essentials, £27.70, which contains five decent sized products and would last at least a fortnight of use. It covers cleanser, moisturiser, shave cream, shampoo and shower gel, and a clever little product called ‘fatigue fighter’. When it comes to sunscreen, it needs to be high factor and totally waterproof, as when he’s not in the water, he’s sweating it out on the golf course. 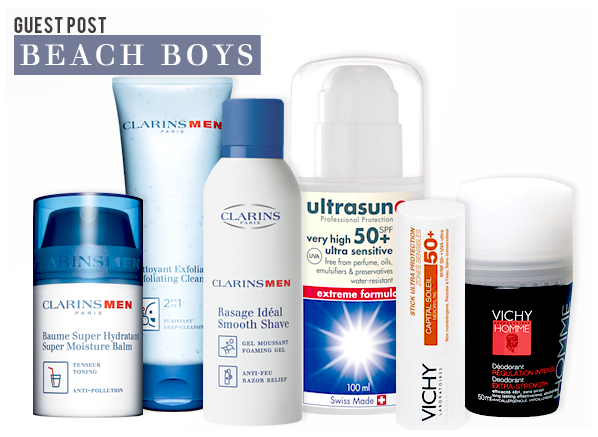 Ultrasun is my brand of choice, with Very High SPF50+ Ultra Sensitive Extreme Formula, £16.90 the product that would make it into his holiday washbag. The airless pump makes it a doddle to apply, whilst the oil-free, non-greasy formula makes it feel lightweight on skin. He also needs a good block – and a stick formula is quick, easy and long lasting. Vichy Capital Soleil Stick SPF50, £7.20, is effective and very affordable. It’s great for protecting burnt noses and ears. Travel-sized fragrance used to be rather niche, but these days all the popular scents come in miniature bottles. I love it when my husband wears Gucci Guilty Pour Homme, £28.90, with its heady, unique scent, so I make sure he has a Travel Spray for those balmy holiday evenings. The bottle is just 30ml and has a striking, stylish design. He’s usually a spray man, but a roll-on deodorant is more portable and just as effective for holidays. Vichy Homme Intense Roll-on Anti-Perspirant, £3.75, is far better than the affordable price tag suggests. It provides 24-hour effectiveness, with an alcohol-free formula to prevent irritation when the weather hots up. A solid wax stick works best for styling hair in warm climates, as the compact formula is less likely to melt in the heat. TIGI Bed Head Wax Stick, £12.20, instantly creates texture and hold. It’s lightweight too, so a much better option than a heavy pot of gel when it comes to that baggage allowance. First time shopper with Escentual.com, opened an account and ordered this product around 2.30pm yesterday and arrived this morning with free delivery as bought 2 of these items - fantastic service!!!! As for the product , well the value is superb. Really wanted this for the full size exfoliating cleanser which is superb and usually around £18 on it's own, add in the full size Super moisture balm at around £22 (or more), and you just can not go wrong at this price. Absolutely ideal as a gift idea. Highly recommended!! This entry was posted on Monday, August 6th, 2012 at 9:41 am and is filed under Fragrance, Guest bloggers, Men, Skincare, Sun and Tanning. You can follow any responses to this entry through the RSS 2.0 feed. You can skip to the end and leave a response. Pinging is currently not allowed.